A. Six Moon Designs Deschutes CF tarp with Line Loc #3’s, Glowire & Stuff Sack: 8.46 oz. B. 2 mil Plastic Drop Cloth Ground Sheet (36″ x 84″): 3.03 oz. C. Vargo Titanium 6″ Hook Stakes (8) and Homemade Cuben Stuff Sack: 2.51 oz. 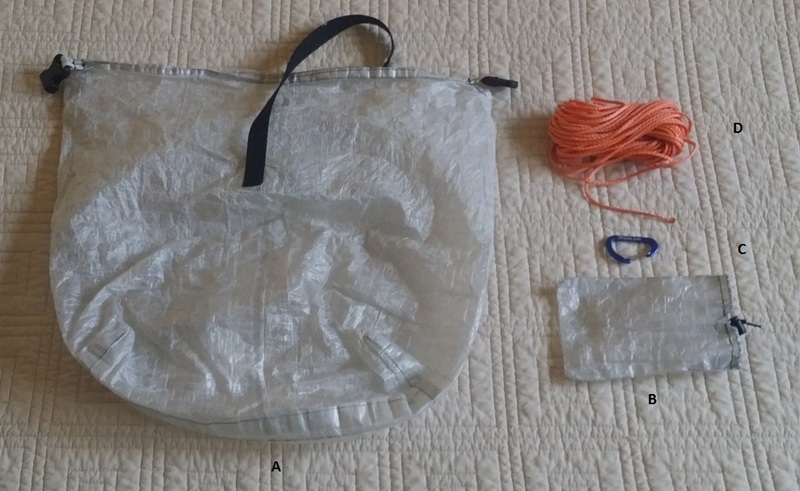 B. Homemade Cuben Dry Sack: 0.60 oz. C. 1/8″ Evazote Pad (24″ x 74″): 4.16 oz. A. Homemade Titanium Windscreen/Potstand: 0.67 oz. B. Recycled Heineken Beer Can Pot and Lid with elastic wrist band for pot support: 1.38 oz. C. Mini Bic Lighter: 0.40 oz. D. Recycled Plastic Frozen Yogurt Spoon: 0.24 oz. 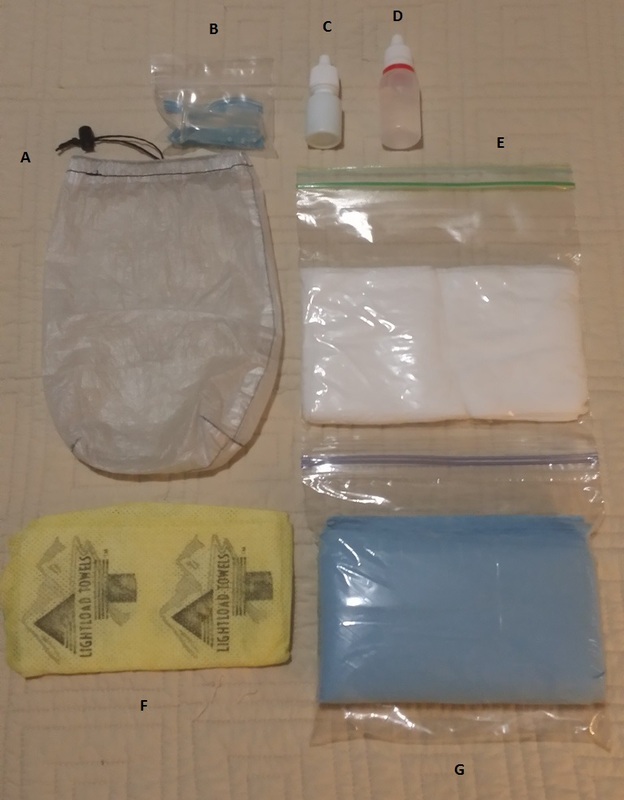 E. Homemade Cuben Fiber Stuff Sack: 0.09 oz. 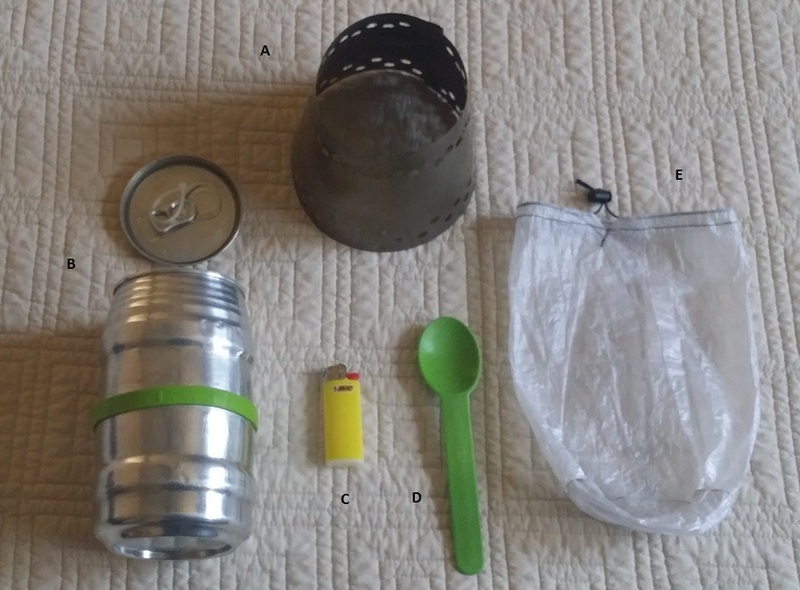 A. Homemade Cuben Fiber Food Bag with Haul Loop: 1.22 oz. 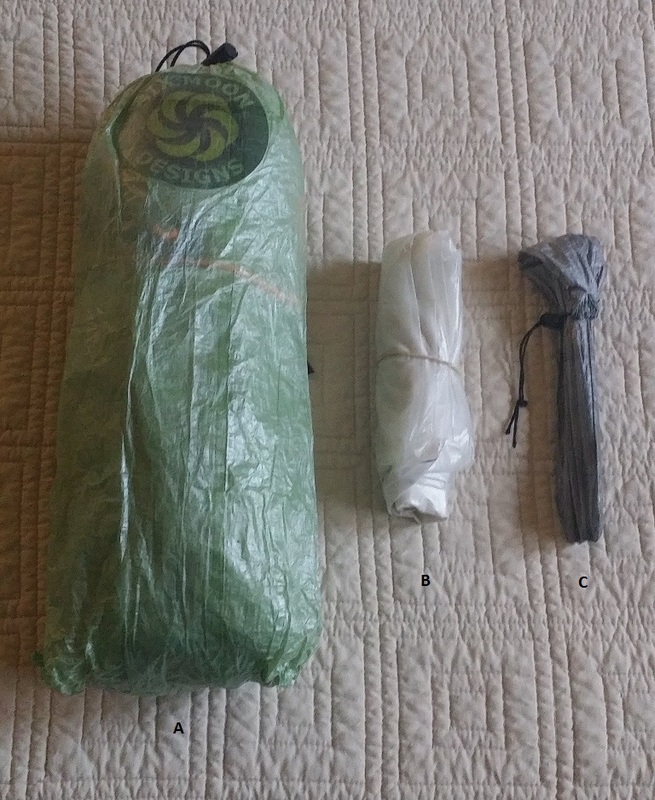 B. Homemade Cuben Fiber Rock Sack: 0.09 oz. C. ZPacks Mini Carabiner: 0.12 oz. D. ZPacks 2.2 mm Orange Slick Z-Line (50 ft): 1.31 oz. A. Recycled 1L Deja Blue Water Bottle (2): 2.46 oz. 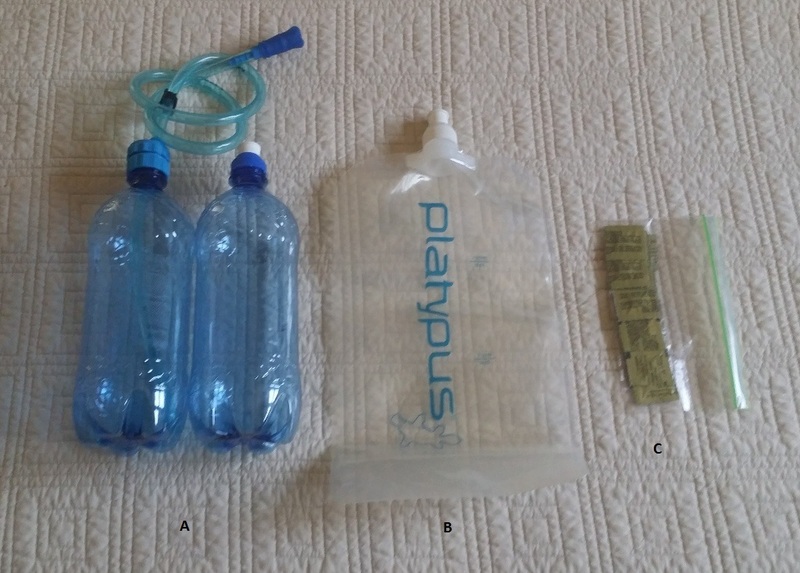 & SmarTube Hydration Tube and Cap: 2.41 oz. B. 2L Platypus Bottle: 1.35 oz. C. Micropur ClO2 Tablets (25) in ziploc: 0.70 oz. 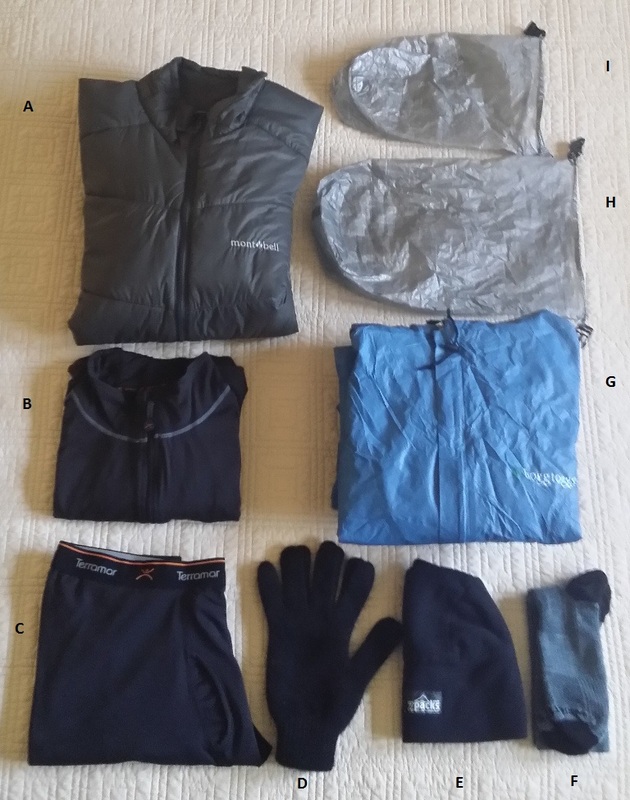 A. Montbell Thermawrap UL Jacket (XL): 10.45 oz. B. Terramar Therm. II 1/4-Zip Top (L): 8.00 oz. C. Terramar Therm. II Bottoms (L): 5.43 oz. D. PossumDown Gloves (XL): 1.48 oz. E. ZPacks Fleece Hat: 1.07 oz. F. WrightSock CoolMesh II Crew Socks: 1.70 oz. G. Dri-Ducks Rain Jacket & Pants (M): 9.85 oz. 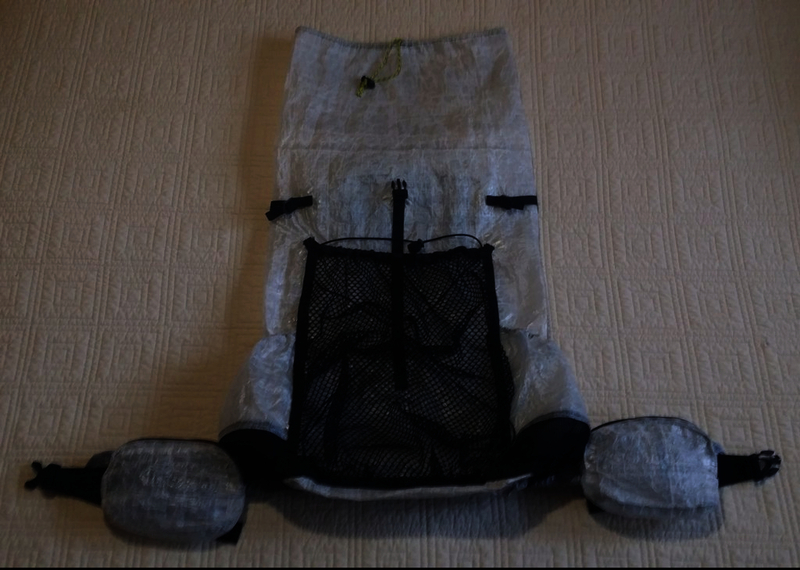 H. Homemade Cuben Fiber Dry Sack for Clothes: 0.64 oz. 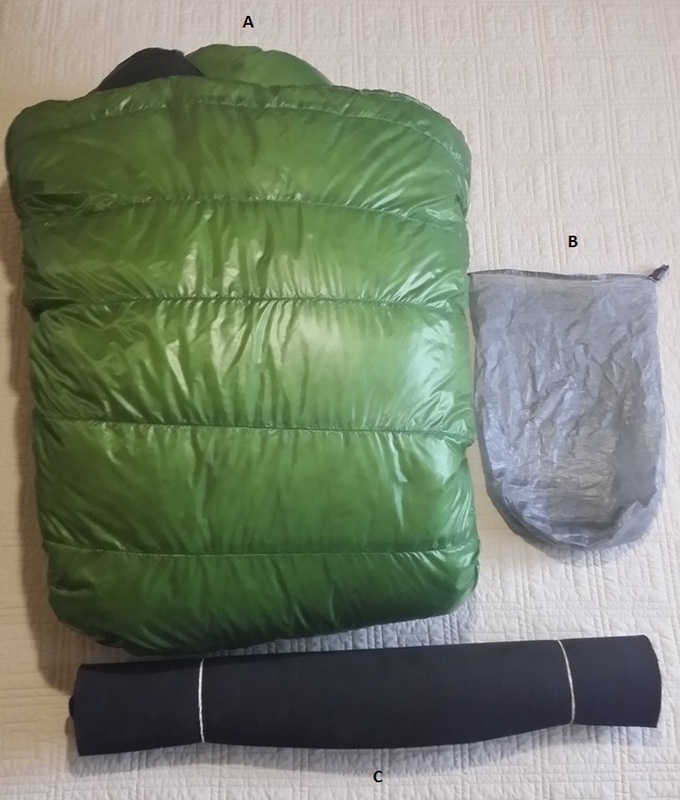 I. Homemade Cuben Fiber Dry Sack for Jacket: 0.46 oz. A. Homemade Cuben Fiber Stuff Sack: 0.10 oz. B. Finger-Tip Toothbrush in mini ziploc: 0.21 oz. C. Dr. Bronner’s Soap in 1/3 oz Round Dropper Bottle (also used to brush teeth): 0.53 oz. D. Purell Hand Sanitizer in 1/2 oz. Round Dropper Bottle: 0.84 oz. E. Unscented Wet Wipes in ziploc (10): 0.76 oz. F. 12″ x 12″ Light Load Towel: 0.26 oz. G. Blue Shop Towel cut into squares for TP (20): 1.33 oz. A. Generic Bug Headnet: 0.35 oz. C. Wilson (He’s been with every mile so far so I couldn’t leave him behind now): 0.10 oz. D. Gossamer Gear Beeswax Lip Balm: 0.20 oz. E. Ben’s 100% Deet in 1/3 oz. Oval Dropper Bottle: 0.51 oz. F. Purell Hand Sanitizer in 1/2 oz. Round Dropper Bottle: 0.84 oz. G. Sawyer SPF 50 Sunscreen in Coghlan’s 1/2 oz. Flip Top Container: 0.38 oz. H. Petzl e+Lite Headlamp: 0.92 oz. I. Spare Phone Battery in small ziploc: 1.82 oz. J. WeatherMax All-Weather Note Pad Paper (5 sheets): 0.20 oz. K. Cut Down Pencil with Ink Pen Cap: 0.15 oz. L. 13 Gallon Kitchen Trash Bag: 0.28 oz. M. UCO Stormproof Matches in mini ziploc (6): 0.19 oz. N. Spark-Lite Fire Starter with 3 Tenders in mini ziploc: 0.31 oz. O. Imodium (6) in mini ziploc: 0.03 oz. P. Spare Batteries (2 CR2032’s for Petzl and 2 CR2016’s for Photon) in mini ziploc: 0.32 oz. Q. Reel of Dental Floss and Needle for repairs in mini ziploc: 0.07 oz. S. Benadryl (6) in mini ziploc: 0.05 oz. T. Assorted Bandages, Ointments, etc. in ziploc: 0.57 oz. U. Ibuprofen (12) in mini ziploc: 0.13 oz. V. Small Zip Tie (2): 0.03 oz. W. Not shown – Samsung Galaxy Note 3 Phone: 8.85 oz. A. Casio Twin Sensor Watch: 1.95 oz. B. Mini Bic Lighter: 0.40 oz. C. Paracord Bracelet: 0.67 oz. D. Swiss Army Classic Knife: 0.74 oz. E. Coghlan’s Compass/Thermometer: 0.45 oz. F. UST JetScream Whistle: 0.10 oz. G. Photon Freedom Micro Light (stripped): 0.24 oz. H. Glowire Lanyard: 0.11 oz. I. 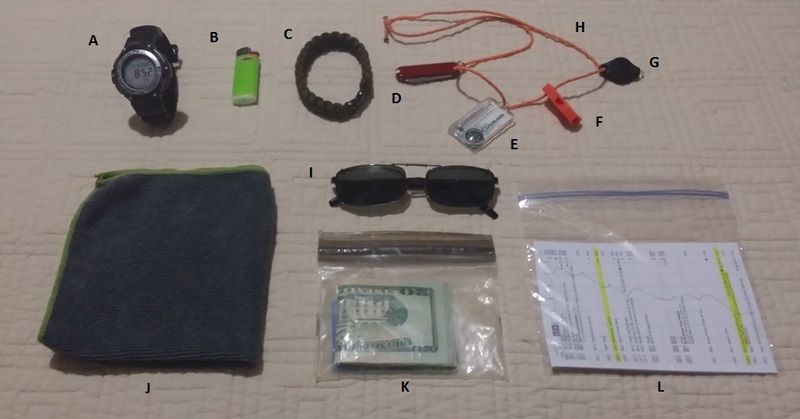 Eye Glasses and Clip-On Sunglasses: 1.08 oz. J. Micro-Fiber Towel: 0.69 oz. K. ID, Credit Card and Cash in small Aloksak: 0.87 oz. L. Guide Book Pages in ziploc: 0.45 oz. 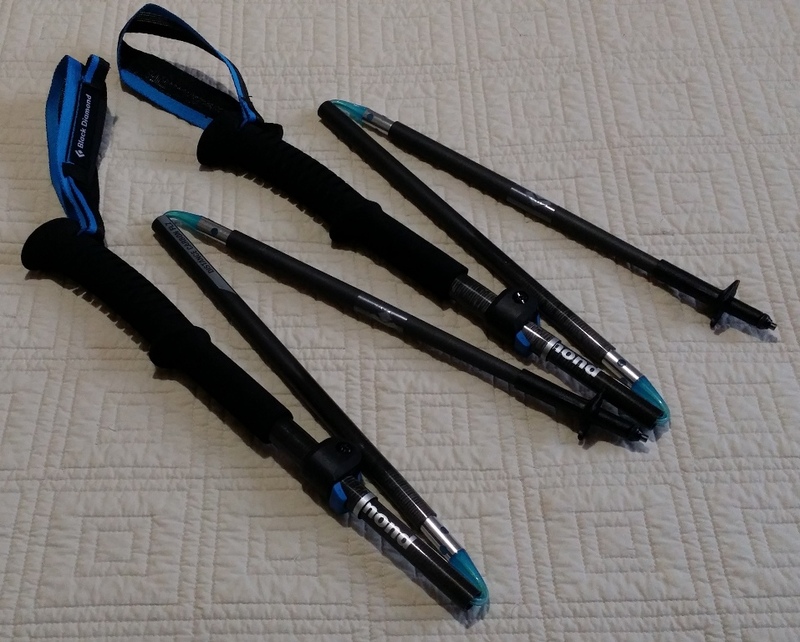 Black Diamond Distance Carbon FLZ Trekking Poles (with length of duct tape wrapped around each): 12.60 oz. A. Old Eddie Bauer Zip-Off Pants: 15.16 oz. B. Patagonia Capilene II 1/4″ Zip Top: 6.46 oz. C. Under Armor Heat Gear Short Sleeve Shirt: 4.45 oz. D. Ball Cap: 2.80 oz. 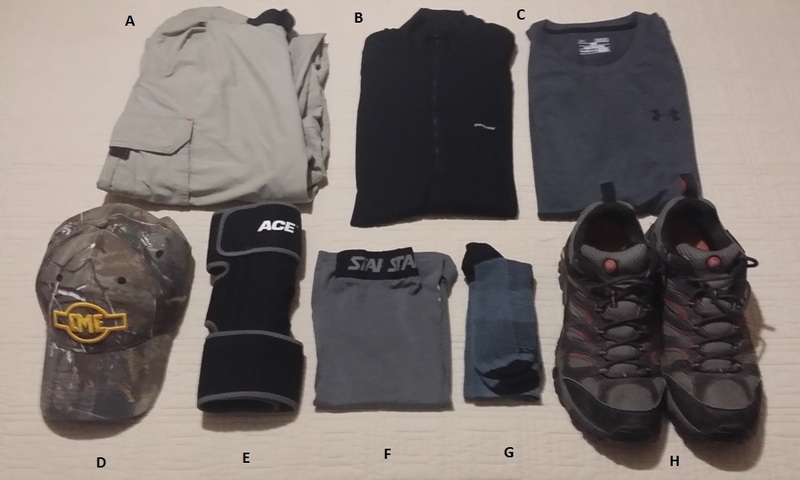 E. Ace Knee Brace: 6.95 oz. G. WrightSock CoolMesh II Crew Socks: 1.70 oz. 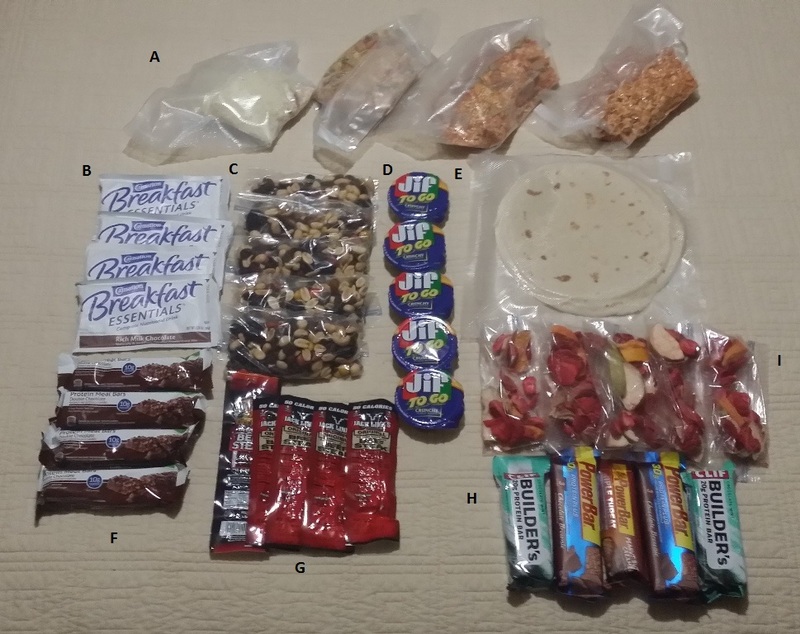 FOOD (4.5 days): 103.70 oz. Repackaged Esbit Tablets (5): 3.00 oz. Water (generally no more than 2L): 70.40 oz.